Theophilus AV Solidus. Constantinople mint, 829-830 AD. 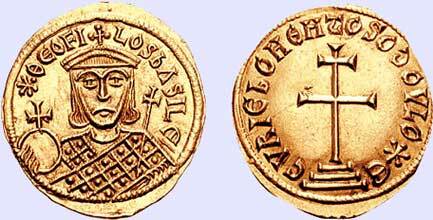 Theophilos or Theophilus (Greek: Θεόφιλος), (813 – 842) was Byzantine emperor from 829 to 842. He was the second emperor of the Amorian dynasty. 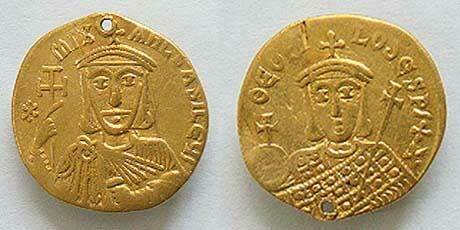 Theophilos was the son of the future Emperor Michael II and Thekla, and the godson of Emperor Leo V the Armenian. Michael II crowned Theophilos co-emperor in 822, shortly after his own accession. Unlike his father, Theophilos received an extensive education, and showed interest in the arts. On October 2, 829, Theophilos succeeded his father as sole emperor. Unlike his father Michael II, Theophilos showed himself a fervent iconoclast. In 832 he issued an edict strictly forbidding the veneration of icons; but the stories of his cruel treatment of recalcitrants are so extreme that some think they are exaggerated. Theophilos also saw himself as the champion of justice, which he served most ostentatiously by executing his father's co-conspirators against Leo V immediately after his accession. His reputation as a judge endured, and in the literary composition Timarion Theophilos features as one of the judges in the Netherworld. At the time of his accession, Theophilos was obliged to wage wars against the Arabs on two fronts. Sicily was once again invaded by the Arabs, who took Palermo after a year-long siege in 831, established the Emirate of Sicily and gradually continued to expand across the island. The invasion of Anatolia by the Abbasid Caliph Al-Ma'mun in 830 was faced by the emperor himself, but the Byzantines were defeated and lost several fortresses. In 831 Theophilos retaliated by leading a large army into Cilicia and capturing Tarsus. The emperor returned to Constantinople in triumph, but in the Autumn was defeated by the enemy in Cappadocia. Another defeat in the same province in 833 forced Theophilos to sue for peace, which he obtained the next year, after the death of Al-Ma'mun. During the respite from the war against the Abbasids, Theophilos arranged for the abduction of the Byzantine captives settled north of the Danube by Krum of Bulgaria. The rescue operation was carried out with success in c. 836, and the peace between Bulgaria and the Byzantine Empire was quickly restored. However, it proved impossible to maintain peace in the East. Theophilos had given asylum to a number of Persian refugees in 834, including Nasr, baptized Theophobos, who married the emperor's aunt Irene, and became one of his generals. With relations with the Abbasids deteriorating, Theophilos prepared for a new war. In 837 Theophilos led a vast army towards Mesopotamia, and captured Melitene and Samosata. The emperor also took Zapetra (Zibatra, Sozopetra), the birthplace of the Caliph al-Mu'tasim, destroying it. Theophilos returned to Constantinople in triumph. Eager for revenge, al-Mu'tasim assembled a vast army and invaded Anatolia in 838. One division of his army defeated Theophilos, who commanded in person, at Dazimon, and the emperor barely escaped with his life thanks to Theophobos. Another corps of the Abbasid army advanced against Amorion, the cradle of the dynasty. After a brave resistance of fifty-five days, the city fell into al-Mu'tasim's hands through treachery on September 23, 838. Thirty thousand of the inhabitants were slain, the rest sold as slaves, and the city razed to the ground. Theophilos never recovered from the blow; his health gradually failed, and he died on January 20, 842. His character has been the subject of considerable discussion, some regarding him as one of the ablest of the Byzantine emperors, others as an ordinary oriental despot, an overrated and insignificant ruler. There is no doubt that he did his best to check corruption and oppression on the part of his officials, and administered justice with strict impartiality, although his punishments did not always fit the crime. In spite of the drain of the war in Asia and the large sums spent by Theophilos on building, commerce, industry, and the finances of the empire were in a most flourishing condition, the credit of which was in great measure due to the highly efficient administration of the department. Theophilos, who had received an excellent education from John Hylilas, the grammarian, was a great admirer of music and a lover of art, although his taste was not of the highest. He strengthened the Walls of Constantinople, and built a hospital, which continued in existence till the latest times of the Byzantine Empire. Michael II and Theophilos A.D. 820-829. AV Solidus. 4.257 grams. Constantinople mint. Bust facing, with short beard, wearing crown and chlamys, and holding cross potent and akakia. Facing bust of Theophilos, beardless, wearing crown and loros, and holding globe cross and cruciform sceptre. Constantine, co-emperor from c. 833 to c. 835. Michael III, who succeeded as emperor. Maria, who married the Caesar Alexios Mouseles. Thekla, who was a mistress of Emperor Basil I the Macedonian. This article incorporates text from the 1911 Encyclopædia Britannica, which is in the public domain.